The theatrical rights of Vijay's Jilla for the Coimbatore circuit have been grabbed by Cosmo Films. They recently distributed Arrambam successfully in this circuit and are all geared up to repeat the success with Jilla too. 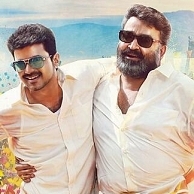 Jilla is slated for a Pongal release and the movie's filming has been completed. Once the censor formalities are completed, the film's exact release date would be announced. We hear that Cosmo Films are looking at around 60 screens to release Jilla and this number is more than the screen count of Arrambam. Nesan directs this mass entertainer also featuring Mohanlal and Kajal Agarwal. People looking for online information on Ilayathalapathy Vijay, Jilla, Jilla screen count, Mohanlal will find this news story useful.